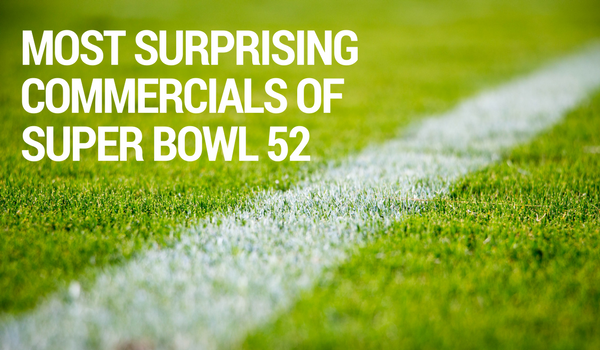 In terms of this year’s commercials, some are calling it the #BoringBowl—although the same cannot be said for the actually game. Personally, part of the boring aspect is that a significant amount of ads could be found online days before the game. By my count, half of the top ten on USA Today’s Ad Meter list were online early last week. While there were some inspiring commercials, most had either already aired or could have been seen online before the game. But who is hyped for the Olympics to start at the end of the week? So instead of the best ads of this year, let’s do the most surprising, the ones we didn’t see coming. David Harbour‘s multiple Tide commercials throughout the night were my top picks this year. His rhetorical question at the end of the 60-second introductory spot is a perfect lead in to the others throughout the night, “Does this make every Super Bowl ad a Tide ad?” Bringing back the Old Spice man (a fan favorite not seen in years) was a great way to start to bait and switch the audience, as was finishing off the Tide commercials for the night with last year’s Mr. Clean commercial actually being a Tide commercial. Proctor and Gamble—which owns Tide, Old Spice, and Mr. Clean—also got to double dip in these ads, using iconic, well-recognized spokesmen for other brands beside Tide, without actually using the Old Spice or Mr. Clean logos or taglines. See all the ads together in the video below. Lately, Rocket Mortgage ads have featured confident people doing what they’re confident in and then fumbling when it comes to mortgages, with Rocket Mortgage being the perfect way to become confident when applying confidently. But Keegan Michael Key’s spot takes it in a different direction. Playing off of his role as President Obama’s anger translator in a running Key and Peele sketch, Keegan Michael Key translates complicated, highfalutin, mumbo jumbo into words that everyone can understand. It’s a great nod to a classic Key character, plus it distances Rocket Mortgage from popular conceptions about how complicated mortgages can be. And, in case you have’t seen Luther, Obama’s anger translator, check out the sketches here. The shorter Eli Manning spots throughout the game didn’t really mean much until they culminated in this ad, featuring Odell Beckham, Jr. The perfectly-timed pop-up with the beginning of “I’ve Had the Time of My Life” lets you know you’re in for a treat. The on-point choreography and the “just let them dance” from the sideline come together for the classic Dirty Dancing lift. If I thought for a second this could be a real touchdown celebration, I’d root for the Giants. While Eli’s choreographer called him “coachable,” the same cannot be said for his brother, Peyton. At least not in his Super Bowl ad. Never one to take himself too seriously, Peyton’s Universal commercial was fun to watch. And even though this ad was available earlier in the week, Peyton yelling “Omaha!” for everyone to get together for a photo was a great call back to his NFL career. Up until the Eagles were named NFC Champions over the Vikings, there was a chance that a home team would play at the Super Bowl for the first time ever. So I wonder if Ram made two versions of this ad, one in case the Vikings did make it to the Super Bowl and this version, in case they didn’t. Either way, it’s fun to see them rocking out to Queen, A Knight’s Tale style, and pulling towing the truck through the water like the truck tows their boat. I was really hoping for a knockout conclusion to the Dilly Dilly Bud Light ads. Instead, we got the Bud Knight and his unexplained magical sword; did the other army leave after that? Did the Dilly Dilly people get the Bud Light they wanted? Did the two armies come together to drink beer and complain about the Bud Knight? So many questions! As good as the whole series of ads was, this conclusion left much to be desired. Also, there was a missed opportunity from Febreze to use OutKast’s Roses on the Bleep Don’t Stink commercial. It’s practically a line right out of the song. It’s so similar, that I had Roses stuck in my head after the spot aired. While there wasn’t anything too outgoing or inspirational or political, I wouldn’t say this year’s ads were boring. Maybe if the game hadn’t been so exciting and the commercials were all we had to look forward to, it would be a different story. As it was, the ads provided a nice laugh in between trick plays, missed kicks, and Hail Mary passes. Need to surprise your audience or bring the quirky back? Give us a call.